Add some more feedback to the open loop vales so we can automagically determine their health.We need both position and current feedback from each valve. I may convert the valves to www.openservo.org derived control electronics. 3)Build a more robust vehicle. Most plumbing, stainless not aluminum. 4)Find a more benign transport system. IPA (cleaner) and E85 cheaper. Do at least one burn with 100% Nitrogen pressurization. With our long thin tanks it might not be as bad as it is for Carmacks Spherical tanks. I've been told that a shot of He followed by N2 pressurization is not bad. the Russians use Nitrogen to pressurize their Lox tanks, and Nitrogen is a Lot Lot Lot cheaper than Hydrogen. 7)Put better data logging software in place. 8)Convert the simulator to a hardware in loop tester. 9)Make the control system fly the helicopter, and publish ALL the results. 10)Try a impinging injector rather than a pintile. 11)Try Charles Pooleys Lox pre-burner idea. 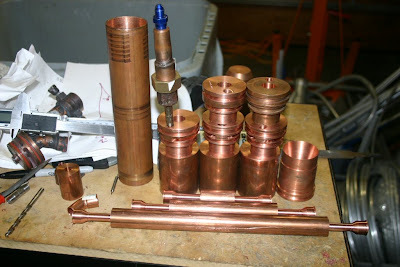 12)Build and leave set up a good valve and injector flow test setup. announced to the world what they had told me in private. Very Secret I know almost nothign about their progress. They had an unflown vehicle at the 2006 XPC, they could be the dark horse. They have an interesting control scheme that always made me wonder. As ready as anyone could be, the "Gold Standard"
They have posted a couple of very quick Rocket Motor videos, the longest being several seconds. We posted our 106 Second firing in April and we did not make it. They have posted no vehicle hardware pictures. They just announced on their blog they are out for 2007. Failed to attend the required team meeting in Aug. They have a very credible vehicle, well constructed and professional Another team that is somewhat secretive and an unknown. They posted finished airframe and rocket firing pictures in Aug. They were planning to have throttling via movable pintile in the all aluminum motor, while technically very cool, not easy to do and Armadillo was never able to make an all aluminum motor last without melting. Announced that they will not make 2007. Announced we will not make it in 2007. Pulled out before the Last team summit. We took the complete vehicle out to FAR to do a four engine static test this weekend. We had a number of transport issues. We finally settled on a U haul trailer. With the motors mounted the vehicle did not fit. So we unmounted the four motors. This left a fair bit dangling plumbing. Realize that this is a trailer with leaf springs and no shocks. The trailer is rated for 4500LBs we put 230 lbs in it. WE then drove for three hours to Mojave. We stopped early in the trip to check the tie downs and again at Mojave. By the time we reached the Arco station in Mojave we had either damaged the plumbing or shaken the hardware off of the valves for 19 of the 21 valves. The trip killed the vehicle. This ends the 2007 effort. Also what are we doing with 21 Valves? This is part of our problem. We could not get the ball valves to throttle/operate fast enough for our throttle and we could not get the fast butterflies to seal so we doubled the quadrant valves. If we had more time we would had fixed the big ball valves with shims and shaped orifices, removing one whole set of valves. We applied a quick fix and it failed. We have 34 days till the practice session at the NG-LLC site. We have 41 days till the contest. I made a spread sheet with a list of the tasks necessary to compete. I made an optimistic and pessimistic time estimate. If I stopped going to work (I've been working 4 days a week) and worked full time for the next 41 days, the optimistic schedule says I have 7 Extra days before the practice session. The Pessimistic schedule says I'd be 4 days late for the contest. My Day Job is CTO of Netburner, I'm one of the founders and the success of that company is the source of funding that makes Unreasonable Rocket possible. In the last year I've been putting most of my creative efforts toward this project and my business has suffered as a result. How much more do I commit? These are agonizing decisions. The Logical decision would be to suspend the effort for this year and restart if there is any prize money left after the contest. I've been trying to keep track of the other teams and Judge the status of their efforts. There are 9 teams. Armadillo is as ready as anyone is ever going to get. Unreasonable Rocket is not going to make it in 2007. Two teams dropped out by not making the summit. That leaves five teams. Two teams have privately told me they won't make it. One team has asked if they can share test days with me at FAR,I Said yes, no problem. (If they are just starting serious rocket engine tests they won't make it) One more team privately told me they were giving up on the 180 second contest for this year. This leaves one team unknown for the 180 second flight. Only Armadillo has anything posted on the FAA website. I have to conclude that it will probably be the Armadillo show this year at XPC. Even Armadillo has some issues, they crashed texel and have a supplier problem with their graphite chambers for long duration high pressure operation. (180 seconds). If I were a betting man I'd give 90% odds that there will still be 2nd place 500K available next year. This has been the most difficult post to write, I know a lot of people have been following and rooting for the father and son team and I'm sorry to let you all down. Be assured that we will continue. We will probably take a month off to rest. Tonight I'm going to do something I have not done in a year. I'm going to sit a and watch the Chargers Patriots game. . I spent 10 years living near Boston, GO Pats, I've spent 15 years in the San Diego area, GO Bolts. So I don't know who to root for, but it should be a good game. I'm really disappointed in the new Google Lunar Xprize. It would be a great prize 10 years from now, but today it just illustrates the core problem with space access. The high cost of access to low earth orbit. The grand prize is 20M only twice what the original x-prize, yet the problem is at least 100 times as hard. I can't imagine what group or company would go after this prize. Even if it is won, I fear it will not add much to reducing the cost of access. It might be done as a stunt with a 500 gm Microrover. If the intent of prizes is to encourage space exploration, A prize to encourage transport development would be so much more useful. I'd like to see a prize for a reusable orbital launcher, just something to launch 350 gram can sats. Tonight I finished the last little bit of wiring on the vehicle. All the cable bundles had been run a few days ago, I just had a few misc connectors to solder on or wiring errors to fix. We then went about systematically checking out quadrants. Some where in the middle of doing this I tripped on the Ethernet cable going to the LapTop and the resultant experiment in inelastic collisions took out the LapTop screen. Fortunately there is no shortage of computers in the Breed household. The vehicle is 100% hardware complete. We weighed it and we are at least 10% under our target weight!!!!!!! I'm not going to publish the weight until I can repeat the measurement, with a better calibrated scale,but this gives us significant performance margin for reaching 180 seconds! 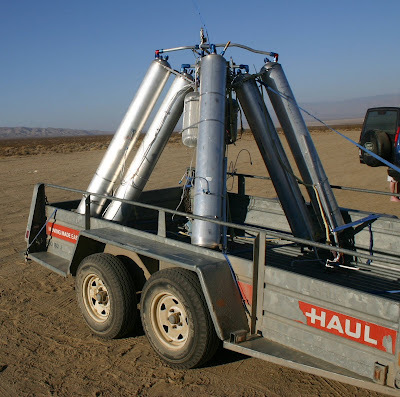 The target weight with payload was 326 lbs. The actual empty weight 230 Lbs. My actual empty weight is 15% under Budget!!! As John Carmack rightly points out it won't be as high as I expect or wish. So I need to realize 66% of theoretical. This is with tanks 90% full. Today I machined the last part. If it all works the rocket hardware is done. We have been trying to test it for the last three weeks. We thought we had a chance to test two weeks ago Saturday. We thought we would test with one motor last Saturday, alas when we flow tested the motor we were going to use, it was unusable, and may be why our last test failed. So I spent the last week building and carefully QA-ing 5 motors. I've taken detailed pictures of the whole process and after the XPC I'll post the drawings and detailed machining documentation. So here it is three weeks after I first thought we might test the full up vehicle in a static fire, I've worked 18 and 20 hour days for three weeks and we have a shot at being ready for Saturday. I keep telling people we are testing next staurday,and I'm feeling like a flake. There are always a million details. 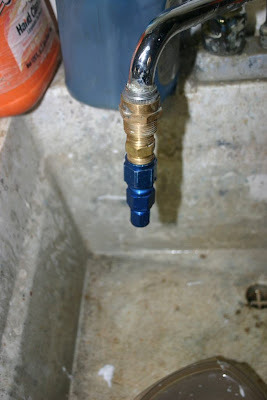 Example Today my son and I are going over the new igniter plumbing and I realized that we had not put in the necessary check valves. So we are redoing that section of plumbing. (My son is currently driving back from the LA McMaster Carr will call with the check valves.) I'll post more later. Do you have a rocket problem? staring at streams of water.. If you can quote the National fire protection standards for cryogenic fluids to the code enforcement officer, without notes. If you know exactly what chemicals are used to denature ethanol, and can quote the stock numbers for the different types from the local chemical supplier. If you collect strange copper sculptures. If you know the density of several kinds of alcohol in both English and metric units. If one of your buddies stops by to visit on the weekend and the first question he asks "are there any stainless chips in the chips on the floor" He's barefoot and his feet are just fine with aluminum chips, but they are not yet tough enough for stainless. If you are proud of your AN fittings collection. If you know the hours of and directions to the McMaster Carr will call window. If you this looks like you, you have arocket problem, seek help.